4 racks (approximately 4 pounds) baby back ribs, each cut in half. In a large stock pot, bring beer, water, and rub to a boil. Stir, then submerge ribs (add more water if necessary). Reduce heat and simmer for 1 1/2 hours partially covered. 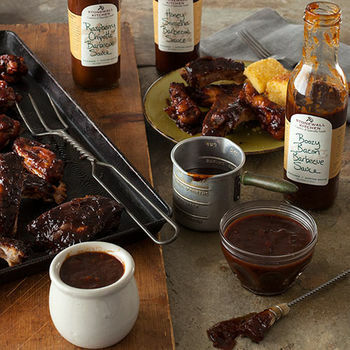 Remove ribs onto a greased rimmed baking sheet and generously coat on both sides with 1/2 bottle of barbecue sauce. Cover and refrigerate until ready to grill (can be refrigerated for several hours). Finish cooking on a medium hot grill, basting often, or in an oven at 350 degrees F for 20-30 minutes. Serve with extra Boozy Bacon Barbecue Sauce.